Granola. It’s one of the most loved cereal options, yet it’s probably one of the most un-healthiest. Do not be fooled my Primal friends! Whilst granola may appear healthy with it’s clever labelling of ‘full of oats, nuts and fiber’, it’s actually packed full of sugar, saturated fats and CARB’s. Not the most healthiest option first thing in the morning! Whilst I may not be the biggest breakfast fan (contrary to popular belief, breakfast isn’t the most important meal of the day, but you read more about that in my book), I know a lot of people are. If that’s you, then that’s fine! Like I say throughout my book, as long as you follow along with the main principles of a Primal lifestyle then that’s absolutely fine. I’d much rather you enjoy a Primal friendly breakfast than indulge in a lifestyle that isn’t for you – especially if that means skipping breakfast! For many, breakfast has to be quick, filling and of course, delicious. You’re much more likely to stick to healthy breakfast’s when it’s all three of those things. 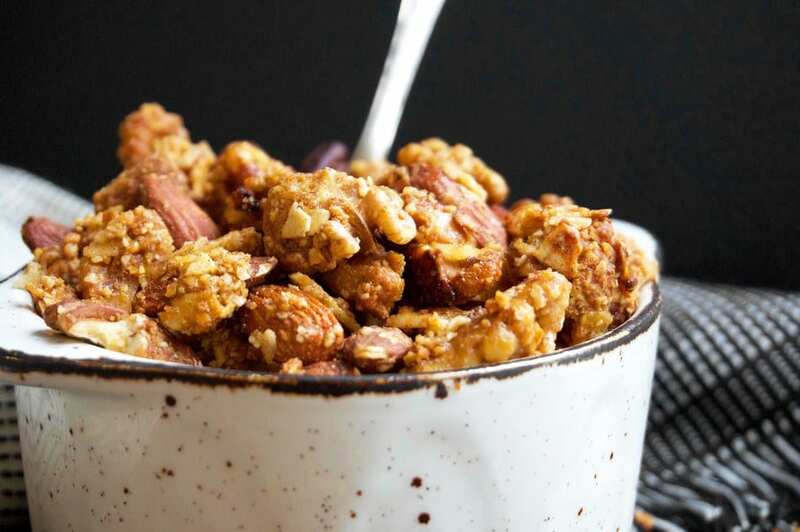 Therefore, I knew this recipe had to be not only quick to make, but full of healthy fats – all whilst replicating the classic granola recipe in the flavour section. Is it really possible to create a primal and paleo friendly granola recipe minus the carbs, saturated fat and sugar? Yes, yes it really is! 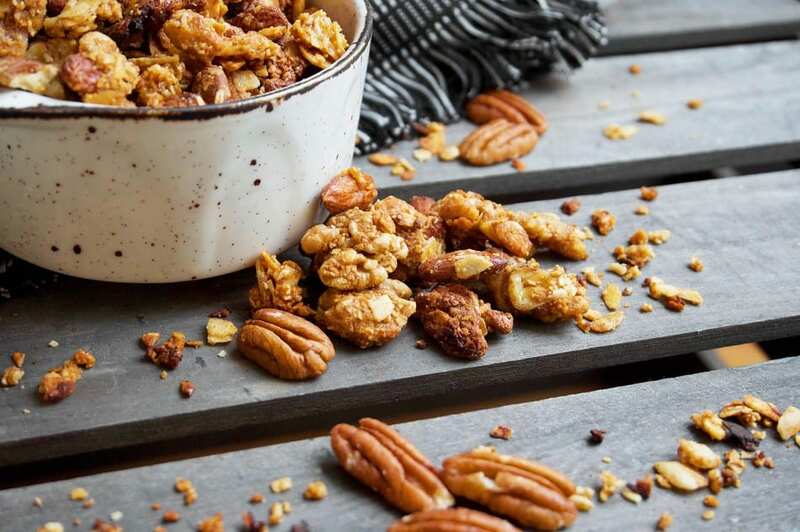 For my nut n’ clusters primal granola recipe I’ve simply swapped out the oats for almond flour, sugar for raw honey, and combined everything with my favourite health benefiting and brain boosting nuts – pecans, walnuts and pecans. The combination of the nuts, raw honey and almond flour are what allow the clusters to form. In fact, without the almond flour, the clusters wouldn’t exist so please do not miss this essential ingredient! If you’re not a fan of almond flour then simply switch it for coconut flour. However, you may find that you’ll need a little extra honey! Plus, this recipe is free from refined sugar, dairy free, grain free and contains a good amount of protein. Be careful though, because this recipe is simply addictive. That’s the only way to describe it. It’s sweet, it’s nutty, it tastes just like the real thing and most importantly, it’s crunchy! The best thing about this recipe is that it’s incredibly versatile! You can simply add whatever you like to it (as long as it’s Primal friendly). If you’re slowly introducing your children to a Primal lifestyle, as well as driving them away from the sugary cereal boxes, then add a few shavings of dark chocolate to the recipe. Not a lot, but a little to make it even more enticing and delicious. Either way, I hope you enjoy this recipe as much as I enjoyed making it primal friendly. I really mean it when I say that turning your favourite foods into something much healthier isn’t as hard (or impossible) as it may seem! You just need a little imagination. 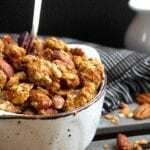 Enjoy and like always, let me know just how much you become addicted to this delicious breakfast/snack friendly recipe! How Primal friendly is this recipe? 10/10! 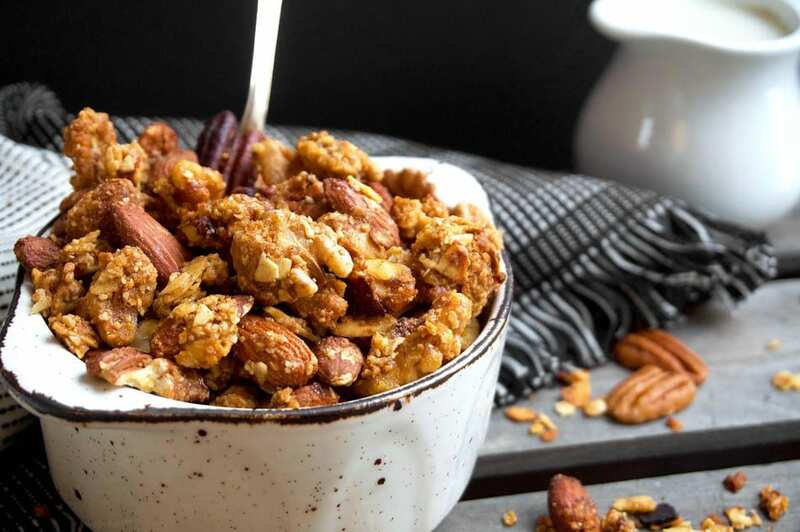 A healthy and primal take on the popular (but also very sugary) breakfast cereal, granola. Full of nothing but healthy fats and a little honey for that extra energy boost in the morning! Begin by pre heating your oven to gas mark 3. In a bowl, add all of your ingredients together and mix together (slowly) until clusters start to form together. Be sure not to over mix as this will break up the clusters. Once your clusters have formed, line a baking tray with parchment paper and lay out your granola. Pop in the middle of the oven to bake for 15 minutes (or until golden and crunchy) and then remove from the oven and leave to cool. 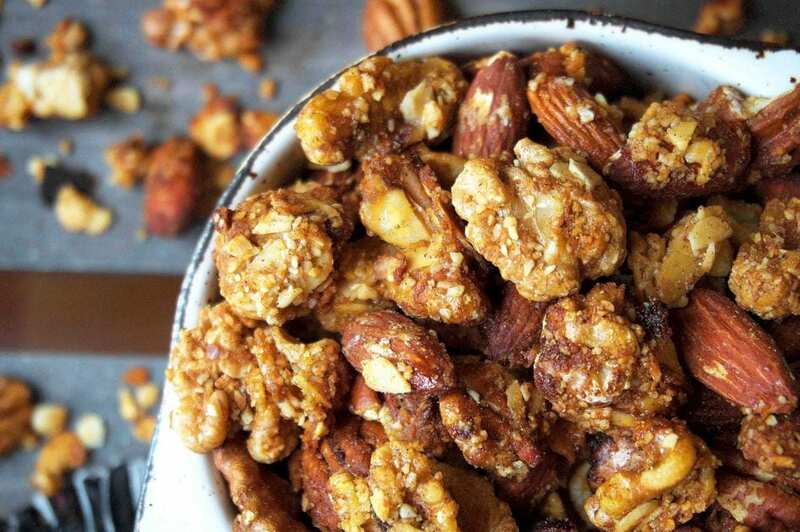 Serve with some milk (or milk of choice) or enjoy as a simple nutty snack! This granola will be kept best in an air tight container for up to a week.